2014 was the year of the 400th anniversary of a calculating paradigm shift: the logarithm. The first Table of Logarithms, “Mirifici Logarithmorum Canonis Descriptio”, was published in 1614 by John Napier, Lord of Merchiston. It seemed fitting to mark this milestone by chronicling everything known about this revolutionary invention as a compendium: the Collectanea de Logarithmis and shown here as a “mind map”. 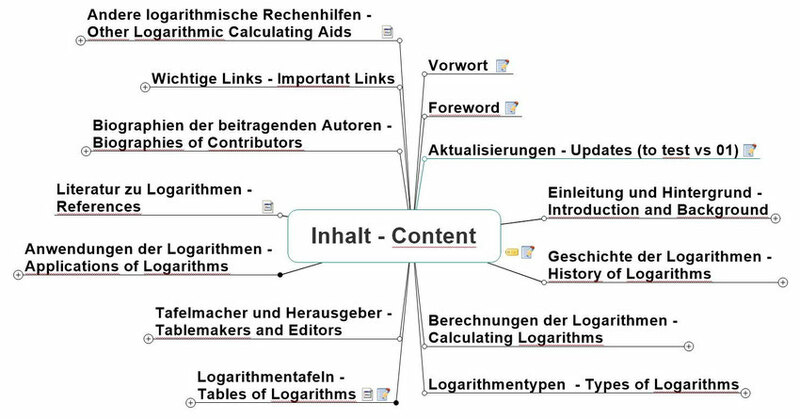 The bilingual German/English content of the Collectanea consists of more than 3200 entries representing umpteen articles, many tables and Internet links relevant to the logarithm. This logarithmic “labour of love” took more than 10 years of research to collect and compile. For example, the topic “Tables of Logarithms” includes a unique 121-page worldwide inventory of more than 3100 tables by the year they were first published, the author, the title, the publisher/city, the language and for many, a link to an online source. However, nearly a quarter of the links is to 700 digitised original tables and most are downloadable. This in turn creates the opportunity to study such tables in-depth and to learn first-hand how their content and design evolved over time. The many specialised articles included with the Collectanea compendium cover logarithm-related areas such as science, engineering, economics, transportation and academic study. Theyprovide a theoretical and in-depth insight into the part played by logarithms during the last five centuries. Some of the over 90 articles, 27 of these in English, have never been previously published or are not readily available anywhere else. So the Collectanea de Logarithmis provides a rich historical account of the role and calculating importance of logarithms. It represents an invaluable resource for further study or reference. Importantly being a unique “one-stop shop”, it will doubtlessly save hours of unfruitful Internet surfing and library visits as everything you are ever likely to need is to hand with the Collectanea. The sheer volume of the contents practically and financially precluded publishing the Collectanea de Logarithmis as a book. So it is only available digitally as a DVD. To protect against plagiarism, copies of the Collectanea come with a USB-stick security device. This PC device activates an offline “home page” on the DVD. Very much mirroring the experience of commercial Internet browsers, the intuitive inbuilt browser makes it easy to navigate through the Collectanea and discover its “Aladdin’s Cave” encyclopedia of information. N.B. : the DVD Collectanea de Logarithmis and the USB-stick security device will only run in a Microsoft (XP/VISTA/Windows 7/8) environment.